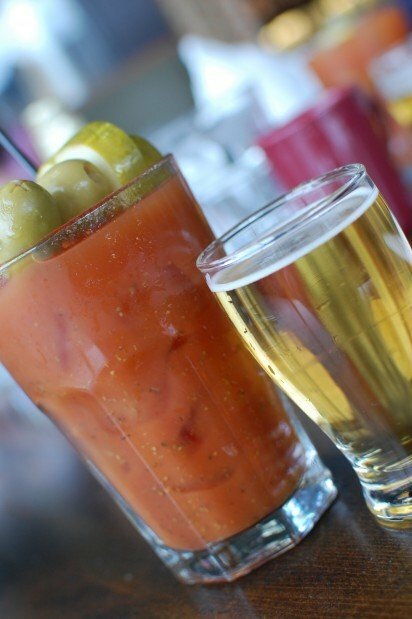 Enjoy a Bloody Mary and beer chaser at Green Well. Cheap beer is on tap at Stella's Lounge. The Green Well has been a hit with locals since it opened. For hotel guys like myself, a night on the town can translate into a year-long expedition for others. I am not kidding, either. When you are surrounded by people who make a living out of going out every night, this agenda is not too far from the ordinary. Come along for the ride, and experience one night in Grand Rapids you definitely won't forget. A good home base with a central location is key. The JW Marriott in downtown Grand Rapids offers the best amenities with panoramic views of the Grand River and the city skyline (not to mention, the author is also the general manager). The JW has an amazing restaurant, six.one.six, which features many locally sourced products including a litter of pigs that adhere to a strict diet prescribed by our executive chef, Justin Dalenberg, at nearby Lucky Star farms. In season, chefs pluck heirloom tomatoes and arugula from the chef's garden on the hotel's patio. Another option is Peaches B&B in the historic Heritage Hill area of downtown. The owner is a fantastic host, and she has a penchant for donning a kitchen apron. Our first stop is the rooftop deck at Rockwell's Republic for happy hour. Rockwell's Republic offers great happy hour specials year-round. A glass of bubbly with a sushi platter is a good start to the weekend. Just like six.one.six, Rockwell's Republic sources many of its products from local farms. Walk down the hill from Rockwell's Republic, turn left on Commerce and look for a door with a keypad. 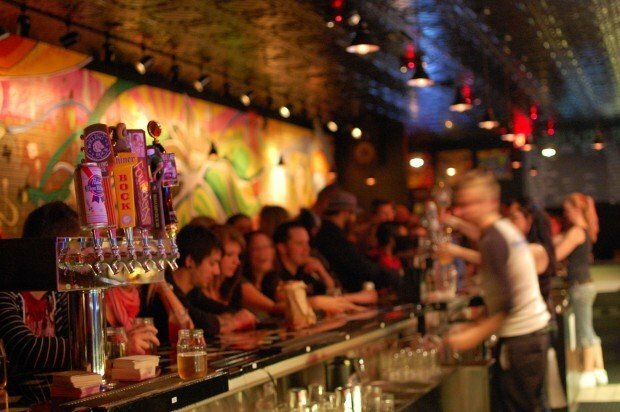 This is Viceroy, Grand Rapids' speakeasy bar. Punch in the code "1930" and walk in as if you're a regular. A few steps past the bar and bathrooms brings the Cure blasting in the background and a scenery change from scotch snifters to PBRs and Strohs in glass canning jars. Welcome to Stella's, where cheap beer, vegetarian dishes and '80s video games collide to make for a pleasant happy hour experience. Grab a can of Strohs, play Tron and Centipede, and feel like you're 16 again (without the beer, of course). I have never had a bad meal at San Chez Bistro. San Chez pioneered the retail and housing development in the area surrounding the arena. Order a pitcher of sangria and go all out with the tapas. The Bistec Lomo is to die for. By now, you should feel like a bowling ball miraculously grew inside your belly from all the wonderful tapas dishes. A glass of cognac or demi-sec is calling your name at my favorite Arena District hangout, Bar Divani. Dim and sultry, Bar Divani is a terrific place for some conversation before shifting your evening into high gear. Mega 80's is a phenomenal '80s cover band that has been rockin' Grand Rapids for the past several years. Ten dollars gets you in. The first set covers the pop and new wave one-hit wonders. The band transforms into a big-hair metal band for the second set. Whether you were a Europe groupie or not, you are guaranteed to fist pump and relive your mullet days just like everyone else at the Intersection. Just when you think it can't get any better, you feel the pull to drag your tired feet one block to the Woods Lounge for last call. You might be in luck if another amazing '80s band, Star Farm, is playing inside wearing their Adidas and Flashdance outfits. Outside on the patio, join the good-looking crowd on the makeshift dance floor in front of the DJ, and push yourself to do one more dance. Nothing beats a good slice of Mac-N-Cheese pizza after a full night of reveling. Pray the line is not too long, because Georgio's Pizza on Ionia Street is fast becoming a tradition for the last people standing in the arena district. After sleeping in, take a nice shower and savor a cup of much-needed coffee. Pack your things and drive to the Cherry Hill district (2 miles from downtown) to the Green Well restaurant for brunch and bloody Marys. I love their brunch menu, especially the barbecued braised pork with andouille and creamy polenta, after the previous evening's entertainment workout. Well, you've come this far, so you might as well go all the way. The Winchester on Wealthy Street is the perfect spot for one more pint of Oberon to salute the weekend's conquest. If you do find a little room for one more dish, the Fish Tacos at the Winchester are a pub classic.